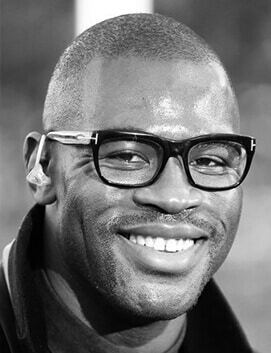 Ugo Monye is a former English International rugby union player and broadcaster. After a few games with Harlequins U19 coach Colin Osborne, the club offered him a professional contract and within 12 months he was a member of the England Sevens team that won the Hong Kong Sevens tournament. Monye was a key member of the England Sevens squad throughout the 2002-2003 and 2003-2004 IRB World Sevens Series, and was part of the team that competed in the 2005 Rugby World Cup Sevens in Hong Kong. Monye also played a part in the England Saxons side that won the Churchill Cup in 2005 and 2008. He first played for Harlequins in the friendly against Glasgow Warriors in August 2002 and began the following season with five tries in two matches including a hat trick against Rotherham Titans at Millmoor. When Harlequins won 70–5 at Twickenham Stoop, Monye scored five tries and Harlequins roared straight back to the Guinness Premiership after a season in National One during which Monye scored a total of 16 tries. Monye made his England debut in England’s 39–13 victory over the Pacific Islanders at Twickenham in 2008 and started the rest of the Autumn Internationals against Australia, South Africa and New Zealand. He scored his first try for England against Scotland at Twickenham in the Six Nations in 2009 and was also selected that year for the British & Irish Lions Tour where he became the highest try scorer of the tournament. In September 2010, Ugo was side-lined for 12 weeks after suffering a career threatening injury. This ruled him out of Martin Johnsons England Squad for the Autumn Test Series and consequently the 2011 Six Nations tournament. He returned to play for Harlequins who he helped to win the Amlin Challenge Cup, before being named in the England training squad for the 2011 Rugby World Cup at the end of the season. He started for Harlequins in their 2011–12 Premiership final victory over Leicester Tigers. Throughout Monye’s career spanning 13 years, he won 14 international caps for England. On 24 March 2015, Monye announced his retirement from the sport. Since then he’s gone on to present for BT Sport and ITV as a credible sports rugby pundit. Ugo Monye is available as a host and after-dinner speaker.